You would think that if Stacey Abrams was on board with this plan (or with the leak to the press), that sentence would read something like “Joe Biden will announce his presidency with Stacey Abrams as his VP.” We know that Biden met with Stacey Abrams this month, at Biden’s request, but we do not know what it really was about or what has come out of it (I reached out to the Abrams camp to see if Biden mentioned what Axios is reporting, and will update the piece if I hear back). If this Axios report is accurate, then it seems highly likely that was the reason why Biden requested a meeting with Stacey Abrams (Axios reported that “Biden’s position on the issue couldn’t be learned,” but considering the sourcing here is “close advisors,” I think “Biden’s position wouldn’t be disclosed” is probably a more accurate reading of the report). If Joe Biden is in favor of this gambit, then that means Joe Biden is acutely aware of his political vulnerabilities (vulnerabilities I believe will ultimately sink his candidacy, no matter who he claims to be his new black friend). He defended the monstrous 1994 Crime Bill he was central in orchestrating as recently as 2016, and he allied with famed racist Strom Thurmond on what Biden wrongly called “forced busing” in the 1970s while fighting school integration. Stacey Abrams is currently working on a grassroots campaign to roll back the systemic injustices sowed into our justice system by politicians like Joe Biden. The onus is on Biden to explain why this isn’t exactly what it looks like. If Joe Biden wants to endorse the kind of vision Stacey Abrams is working to enact, then he should just come out and endorse her platform—call his beloved Crime Bill the mistake reality has proven it to be, take ownership of his past racist comments, and start working towards becoming a better person and legislator. People respond positively to thoughtful, earnest, change—and using a gimmick recently made famous by Ted Cruz doesn’t exactly feel genuine. This is such typical establishment Democrat-speak. The concern isn’t necessarily that an old white man whose two most prominent Congressional moments are writing the 1994 Crime Bill and overseeing the embarrassment of an Anita Hill hearing looks disingenuous in choosing a 45 year-old black woman who is currently dedicating her work to voting rights and criminal justice reform, but the real problem is that it would look like a shot at all the other candidates on stage. If I’m an advisor to Biden, the question I am asking myself is: is this as shallow and manipulative as it looks, or would sticking Stacey Abrams on the ticket mean real, tangible policy change out of Biden? If it’s the latter, then I take back my suspicious snark in this piece. Policy—not personality—is the entire point of why we’re doing this, folks. 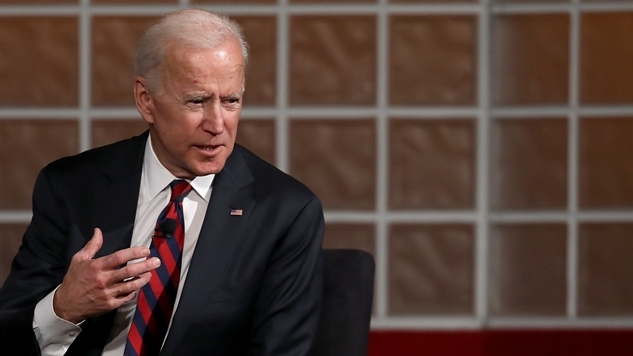 Joe Biden’s history is littered with bad policy, and that’s why I believe him to be a bad candidate (keep in mind, Biden never eclipsed 5% in 2008 and dropped out of the primary after the Iowa caucus, his popularity is completely tied to President Obama). Joe Biden will spend his entire primary campaign fending off attacks on his record by either defending now-unpopular policy, or repudiating his work—and neither is a particularly convincing case that he is able to take on massive systemic challenges we face. Putting Stacey Abrams’ policies front and center on Biden’s platform would indicate that he does understand the systemic injustices in America, and would go a long way towards justifying a Biden candidacy as truly substantive, instead of the “Republicans are actually good” West Wing nostalgia trip his quotes have indicated his 2020 candidacy will be.